US Open 2018 Live Score Streaming, Women's semi-finals: Naomi Osaka set up a final with her idol Serena Williams at the US Open. 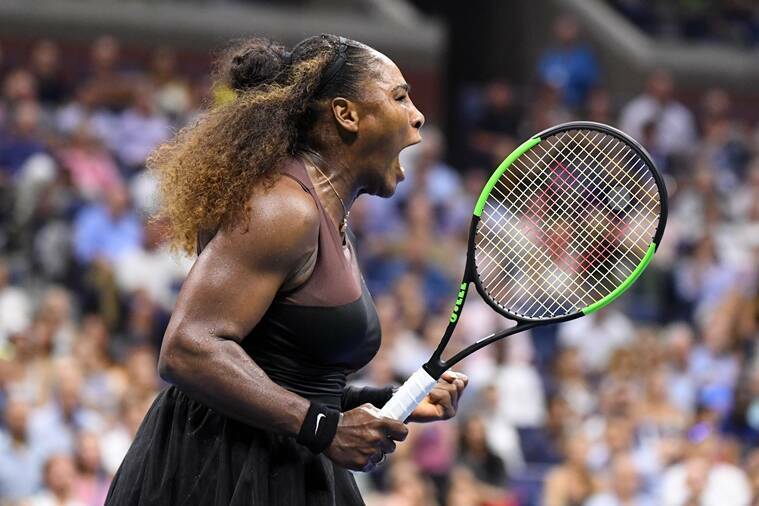 US Open 2018 Highlights, Women’s singles semi-finals: Serena Williams progressed to second straight majors final by beating Anastasija Sevastova in comfortable fashion – 6-3, 6-0 for her ninth final at the US Open and 31st overall. After dropping the first two games, Serena powered through winning the next 12 of 13 games. In the final she will face 20-year-old Naomi Osaka who will be making her first grand slam final appearance and is the first Japanese player to reach the final of a major. She saved 13 break points on her way to beating Madison Keys 6-3, 6-4 in the second semifinal on a closed Arthur Ashe Stadium owing to expected thunderstorms in the Flushing Meadows area. The final will be played on Saturday. Osaka: 2 aces, 1 double-fault, 70% 1st serves in, 64% 1st serves won, 58% 2nd serve points won, 72% returns in play, 3 of 4 break points won, 13 of 13 break points saved, 13 winners, 20 unforced errors. Keys: 3 aces, 0 double-faults, 72% 1st serves in, 68% 1st serve points won, 38% 2nd serve points won, 72% returns in play, 0 of 13 break points won, 1 of 4 break points saved, 23 winners, 32 unforced errors. Naomi Osaka now serving for the match. Drops the first point and then comes back to make it 15-15. Forces Madison Keys into an error and its 30-15. Angled shot on the backhand and Keys sends hers wide. MATCH POINT! Serve into Keys' body and she fails to get it back. Hits the top of the frame and into the crowd. NAOMI OSAKA WINS 6-2, 6-4 TO SET UP FINAL WITH SERENA WILLIAMS IN THE 2019 US OPEN. 13th break point chance for Madison Keys as Naomi Osaka sends her backhand wide. And again it goes waste. Osaka slips once during the point and maintains her composure to send her forehand winner past Keys. Back to deuce. Errors piling up for Keys and it brings up game point for Osaka before the American hammers in a forehand winner down the line. No running for that. Poor serve reply and Keys sends the backhand long. What a smooth backhand down the line and Keys can't get it back. After the drama and pressure of the 12 minute game, both players hold their serve comfortably after. Madison Keys continues to trail but she looks more confidently now than she did in the first set. Madison Keys finally wins a game. She lets out a huge scream of "C'mon!" as she makes her way to the chair. Needs to be pumped up if she is to make a way back from this. This game needs two different updates, clearly. Keys with a drop shot, Osaka picks it up and Madison's outstretched volley is long. Keys goes for too much on the forehand and it sails long. What a crucial hold that could be. 12 break points gone for Keys, 5 in this game. Madison Keys has squandered six break point chances but she continues to create chances. 17 shot rally with both players thrashing the ball on the forehand and Keys blinks in the end to let a seventh break point go waste. She creates another one as Osaka sends her forehand long. And saved once again! Osaka finding the smallest of angles and the backhand reply is off the line to bring it back to deuce. Another chance now for Keys as the game reaches almost eight minutes. Keys with a thumping forehand winner on the serve. But she follows it up with a return into the net. 0/9 on break points now Keys. 10th break point chance now for Keys with a lovely drop shot volley. And make that another chance going to waste. Osaka with a big serve and opening up the court with a deep reply. 6th deuce of the game now. Osaka with a backhand into the net and yet another break point - fifth of this game. Will this be it? Game over 10 minutes now. WHAT. A. SECOND. SERVE. Huge, huge ace down the tee and Keys can't help but smile with the bravery on that serve. Another break point for Keys and another ace. What is this game? BREAK! What a woeful way to begin the second set for Madison Keys. She sends her forehand long on break point. Osaka challenged the call and it is indeed long. From 30-15 up, Keys has her serve broken. Six straight games now for Serena. Is this a repeat of the first semifinal? BREAK! Madison Keys is broken at love and that was a poor, poor serving game from the American. Naomi Osaka to serve for the first set when the players change ends. Osaka's serve once again coming under pressure. Keys doing well to turn defence into offense with strong groundstrokes. Osaka coming from a break point down to bring it to deuce. But Keys staying in it with some persistence. Osaka doing well on the ad court and brings the game back to deuce by going after the backhand. On the deuce side, Osaka stretching Keys on the forehand. Keys goes for too much on the forehand and sends it long. Two break points saved and Osaka leads 4-2. Next up on Arthur Ashe Stadium is Naomi Osaka and Madison Keys. Osaka in her first slam semis and Keys looking to book second US Open final spot in two years. Coming through for the match, Osaka wishes to have fun and make the match fun for the people. Keys reckons both players are good hitters and expects the ball to come with as much speed as she hits it. Serena: 4 aces, 1 double-faults, 64% 1st serves in, 76% 1st serves won, 50% 2nd serves won, 77% returns in play, 5 of 10 on break points, 1 of 2 break points saved, 31 winners, 20 unforced errors. Sevastova: 1 ace, 2 double-faults, 60% 1st serves in, 64% 1st serves won, 18% 2nd serves won, 80% returns in play, 1 of 2 break points won, 5 of 10 break points saved, 10 winners, 12 unforced errors. Serena Williams after the match: "I've been working hard on my volleys. I have won a few doubles championships, so I know how to volley. I just usually only come in only to shake hands." "A year ago I was fighting, literally for my life in the hospital. Every time I step out on this court I'm so grateful I have an opportunity to play this sport. No matter what happens semis or finals, I feel like I've already won." SERENA WILLIAMS IS INTO THE US OPEN FINAL! Holds at love and she is into back-to-back major finals. She wins 6-2, 6-0. Her 21st bagel of the US Open and third this year. Winning 12 of the last 13 games. BREAK! Serena Williams giving Sevastova no chance whatsoever. Ever since the drop shot in the third game of the first set, Serena has had a measure of Sevastova each step of the way. Moving to the net so much more in the set and taking the attack on the Latvian. 5-0! Sevastova gets the drop to work this time but Serena is quick to read it and get to it. Sevastova tries to lob but sends it long to bring up break point. Sevastova with a tame backhand shank into the net and Serena now has a 3-0, two break lead. Dreadful start to the second set for Sevastova. A double fault and loose shots to get things underway and Serena has three break points. All three saved with powerful shots before a lucky leave on the Serena pass does go long. Called in but Sevastova challenges and it has indeed gone long. Serena brings up another break point by moving towards the net with some help from the net. Poor drop shot once again and Serena pounces on it for the break. BREAK! All Serena now! After losing five straight games, Sevastova gets one and will force Serena into holding her serve and taking the first set. A comfortable hold this time. Serena: 14 winners, 10 unforced errors. Sevastova: 6 winners, 8 unforced errors. Sevastova's first serve percentage noise diving and Serena crushing the second serves. From 40-15 ahead, Sevastova is back to deuce and getting her serve ploughed. Over 80% on first serve points won and miserable 25% on the second. Goes for a backhand drop but it hits the net to bring up break point. Serena with a confident forehand cross court winner for the break. Serena with four games in a row now and she leads 4-2.